Wow what beautiful weather we have had here in town the last couple days...Yesterday, I started the ritual of the great spring car clean up...it was warm enough that I pulled all the floor mats out shampooed them and washed the car..waxed where needed and vacuumed it out thoroughly! But the spigot handle wouldn't stop running when I turned off the water, so I had to shut it off inside the house...so Today I went to the store bought a new spigot and played plumber! I also went to the garden store and bought some impatiens and geraniums for the flower pots on the patio! The garden is looking up and it is good to see all the new growth...tomorrow, I will run the mower for the first time: hopefully, if it starts! and the garage repair man will be here to fix the garage door which popped a roller pin on Saturday night. Getting the home front taken care of so I can head to the beach and open up there the end of the week. The Lensbaby soft focus lens and inserts came today! as well as the Federal tax return...yeah!! It was a busy day. Last night I processed a couple more images I made on the Saturday Flash Workshop at Horizon Photography Workshops. 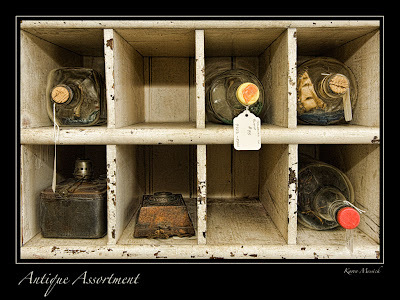 This is a shot I made in an antique store using flash, and I processed it in Topaz Adjust. 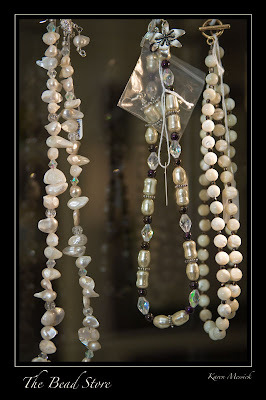 This image was made using flash in a store window from the inside of the shop, I worked hard to get the background dark by opening up the aperture to f2.8 and changing the shutter speed 1/250; at 1/250 of a second there was very little time for the background to register due to the low interior light. This image I made walking the alleys of Chesapeake City after the workshop. 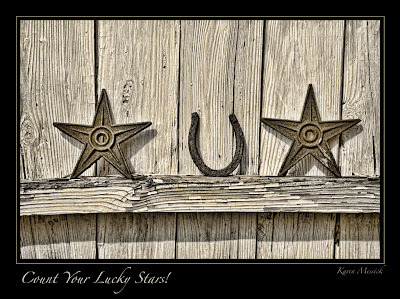 It was in bright sunlight, but I liked the arrangement of items leaning against the textured barn wall. I used natural light and processed it with Topaz adjust.